Tasha with Annie at the University of Arizona’s Equine Center in Tucson. Tasha’s lifelong love of animals led to a 32 year career as a wildlife biologist. As she nears retirement, she wants to get back to working with and helping individual animals. 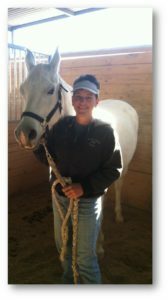 Her practice, “Good Hands Equine Bodywork,” blends her biologist background with practical hands-on bodywork for horses and other animals. Equine bodywork sessions in the Flagstaff area are $75.00, and usually last from an hour to an hour and a half. Contact Tasha for prices for other locations, within or outside of Arizona. Tasha is insured by Associated Bodywork and Massage Professionals (#1086330).